*Update: My original post referred to this dish as Biryani. I later found out that this is actually Chicken Pilau. A great thing about my job is that I work for such a diverse company. 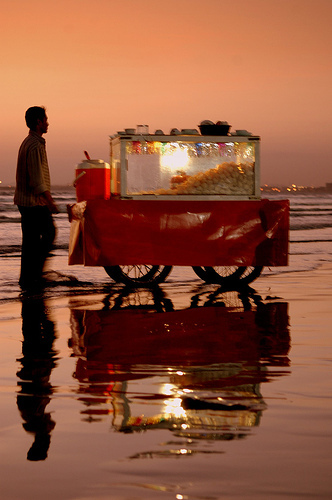 We have many different cultures that love to share the flavors of their world. One of the girls I work with is from Karachi and I love to sample the food that she makes. 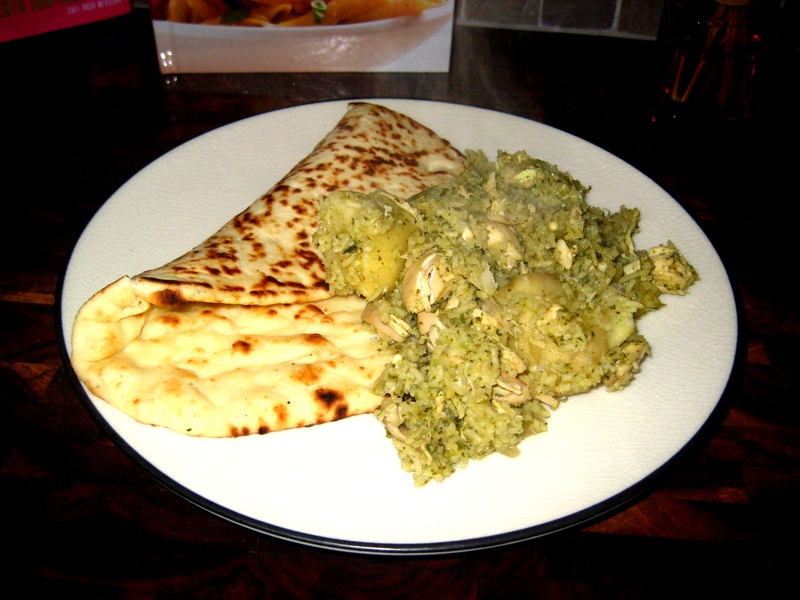 I attempted to make one of the signature dishes of her country, Chicken Pilau, and I thought I would share my experience! Soak the Basmati Rice in water for at least 30 minutes. Boil the whole chicken pieces in a pot of salted boiling water for 15-20 minutes, or until it reaches an internal temperature of 160 degrees. Remove the meet from the bone and cut into bite size chunks. Set aside. 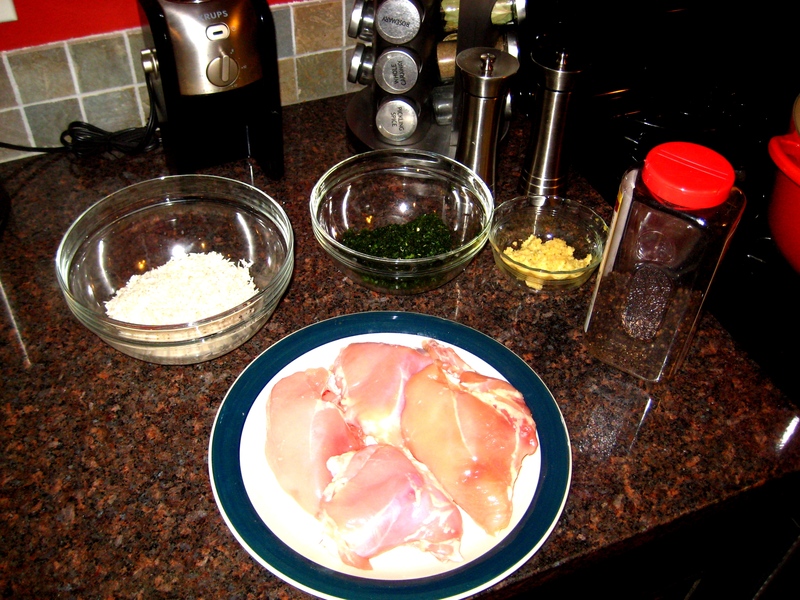 Combine the cilantro and chilis in a food processor and blend until thoroughly chopped. Set aside. 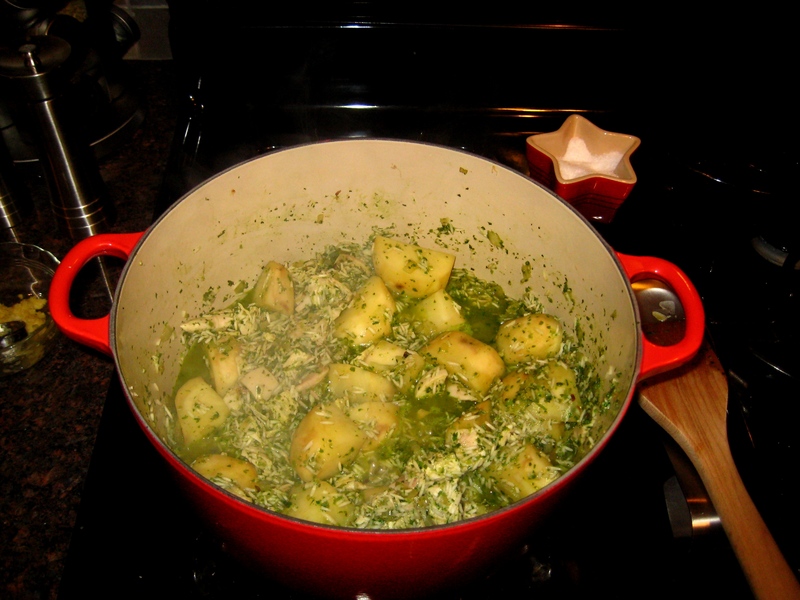 In a large dutch oven, saute the onions, peppercorn, cloves, and cumin in the olive oil, over medium heat, until softened with a hint of color. 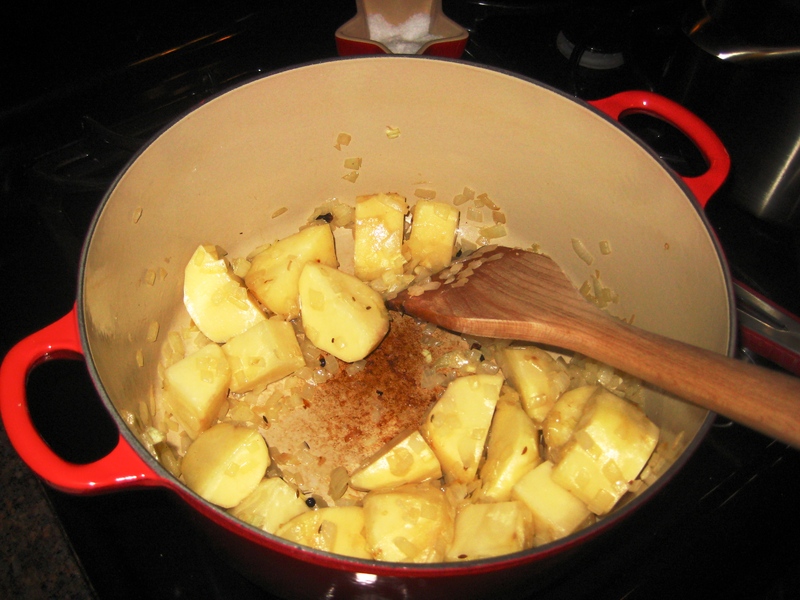 Add the potatoes to the onion mixture and cook for 2-3 minutes. Add the ginger garlic paste and saute until the ginger is no longer fragrant. Add the cilantro mixture and cook for 2-3 minutes. Add the chopped chicken and soaked rice to the onion mixture. Add 1.5 cups of water and cook until mostly evaporated. Cover and bake in oven for 30-35 minutes, or until the rice is completely cooked. After trying the dish it was definitely similar to what Kiran makes, but not as good. It was a bit too spicy and dry. When I went back to work I told Kiran about the dish and she said I didn’t use enough olive oil. She didn’t know the exact amount, but said to use at least 4-5 tablespoons of oil (as opposed to my one). Next time I will coat the bottom of the dutch oven with plenty of oil, and I’ll either reduce my number of serranos, or swap them out with jalapenos. Overall the dish was good, not great, but good and I will definitely be trying it out again. Erykah Badu is one of my all time favorite artists. Her voice and style are so uniquely hers, and she’s a Dallas chick to boot! 🙂 I’m excited about New Amerykah, Pt. 2 and loving the new single! So check out “Up in the Air” featuring Lil Wayne. Sindhi Biryani uses many, many spices. Some ingredients that you missed are two kinds of cardamom, bay leaves, prunes, fresh mint and coriander leaves etc – all of these things come together to give the biryani its fragrance and spicy-tangy (from the prunes) flavor. Which is why you felt it tasted slightly different from your colleague’s version. It wasn’t dry because you used less oil (I never use more than 1-2 tbsp myself) – but because you didn’t use tomatoes and yogurt (also essential ingredients) which make a curry base that sort of steam-cooks the parboiled rice when you layer on top of it and/or lend the rice the moisture your version lacked. If you want to try it again & want a more authentic recipe for it – I’d be happy to give it to you.